Elafonissi Island is near the southeast tip of Crete, 43km from Kastelli and 76km from Chania. The road from Chrisoskalitissa continues as a dirt track of 5km to Elafonissi. There are organized bus tours from Kastelli and Chania as well as boat tours from Paleochora to Elafonisi. The area of Elafonissi has beautiful beaches, in front of which is the island of Elafonisi itself. This lovely islet was the site of a massacre of 850 women and children by the Turks in 1824. The women and children were hidden there and as the Turks camped on the beaches a horse found the shallow, 0.5 - 0.8 metre-deep water path to the island. The Turks discovered the women and children and slaughtered them. There is a memorial plaque on the highest point of the islet. Online Travel guide with the best accommodation in Elafonissi. Find the cheapest hotels is Elafonissi & get exclusive online deals. Great rooms at bargain prices. Book online now! Compare Hotel Prices and read Reviews from others. Great Hotel rates and information See photos, reviews & what's nearby Elafonissi . 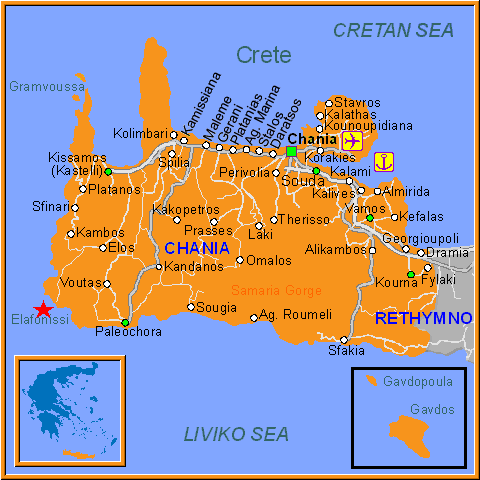 Detailed tourist and travel information about hotels of Elafonissi providing also regional information.